The Uber IPO Is Part of a "Multi-Billion Dollar Revolution"
Subject: The Uber IPO Is Part of a "Multi-Billion Dollar Revolution"
× two = 14 Required Please enter the correct value. Rumors of an Uber IPO started flying earlier this month when the company raised $1.2 billion in a funding round that valued the company at approximately $18.2 billion. Before its most recent round of funding, the company had raised more than $307 million. Benchmark, TPG Capital, and Google Ventures were the company's largest investors at that point. This enormous influx of cash makes Uber the most valuable tech startup on the market right now, and by a significant margin. 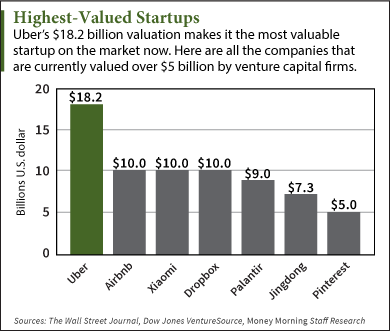 The next closest startups are Airbnb, Xiaomi, and Dropbox, which have all raised $10 billion. While the valuation is high, Money Morning's Defense & Tech Specialist Michael A. Robinson says it's warranted. According to him, the taxi-on-demand service is at the forefront of a major industry evolution. "If ever there was an industry ripe for high-tech disruption it would have to be taxicabs," Robinson said. "Today, many taxis are equipped with GPS and other high-tech gadgets, a quantum leap from the humble beginnings of horse-drawn carriages 400 years ago in England. It's actually a complicated, multi-billion dollar sector that right now is going through perhaps the most profound changes of any business model in the United States." "And the biggest name in the revolution is, of course, Uber." Founders Travis Kalanick and Garrett Camp started Uber in 2009, following an incident where they couldn't hail a taxi during a stay in Paris. Uber allows users to book a ride through a smartphone application, which uses navigation software to pinpoint the locations of users and drivers. The company uses more upscale vehicles like SUVs and town cars, as opposed to traditional taxi cabs. "Many critics argue that when it comes to providing fast service, not much has changed with taxi cabs in the past 400 years," Robinson said. "But that all got turned 180 degrees when Uber was founded in 2009, and its mobile app was launched in 2010 in San Francisco. This app's power derives from the fact that it can identify as many as a dozen drivers a short distance from the person who needs a ride."